We all consume palm oil every day – in our soaps, our snacks, and our gas tanks – and much of it comes at the expense of peat forests, which means we’re pumping millions of tons of carbon dioxide into the atmosphere every year. A new consumer scorecard can help you stop it. Here’s how. 12 March 2014 | Calen May-Tobin recently confessed to using Old Spice since he was 15, and he says that isn’t the worst of his transgressions. But those products, he points out, contain palm oil, which often comes from carbon-rich peat swamps. Draining those swamps pumps hundreds of millions of tons of carbon dioxide and methane into the atmosphere every year, and that accelerates climate change. Some of the world’s largest private conservation efforts, like the Rimba Raya REDD Project, are devoted to reversing that trend, and the Indonesian government has stepped up with support as well, but those efforts will fail if the global economy doesn’t wake up to the challenge. That’s where May-Tobin comes in. He’s a policy analyst with UCS’s Tropical Forest and Climate Initiative, and he’s been tracking the small but influential gaggle of consumer-facing companies that vowed to source palm oil from degraded lands instead of from peat swamps. The result is Donuts, Deodorant, Deforestation, a scorecard that grades 30 top consumer companies in the fast food, personal care, and packaged food sectors. Published last week, the scorecard shows that while some companies are at least coming clean on their impact, most are keeping mum, and even those who have come clean haven’t yet reduced their impact enough to make a difference. Out of ten fast food companies, for example, only two – McDonald’s and Subway – qualified to even receive points on the scorecard, and both scored quite low. Still, he gives them credit for at least acknowledging there is a problem and promising to take action – unlike the other eight. Companies that make personal-care products scored higher, but only one of them – L’Oreal – had become peat-free and only two – L’Oreal and Reckitt Benckiser – had committed to letting their supplies become traceable. 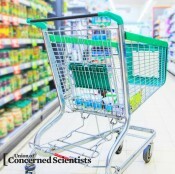 Packaged food companies scored the highest, with four out of ten – namely, Kellogg’s, Mondelez, Nestlé, and Unilever – committing to both purge their supply chains of palm oil that led to deforestation or peat depletion and let their supplies be traced. Now, he says, it’s up to consumers to make sure those promises are kept. May-Tobin’s colleague Doug Boucher says there are plenty of reason to believe those commitments will, in fact, be put into practice. He is UCS’s senior scientist and director of climate research and analysis, and he believes that the shift in emphasis from palm-oil producers to consumer-facing companies like these has pushed the sector towards eliminating palm-driven deforestation. None of this means consumer companies are off the hook, and neither are consumers. Sustainably-harvested palm oil is more expensive in the short-term, but if we don’t pay a little bit extra now, we’ll pay a lot more later. ← Can Oregon and Washington Price Carbon Pollution?